In preparation for the match, both St. John’s and the Naval Academy play the Ginger Cove Croquet Team, from the Ginger Cove retirement community. They have met a few weeks prior to the St. John’s match each year since 1992. The day before the match, the Johnnies have lunch with the Midshipmen at the Academy mess hall, where the Imperial Wicket for the Johnnies formally challenges the Midshipmen to a match. The match opens with music. The St. John’s Freshman Chorus sings and the Naval Academy Trident Brass band plays. The Johnnies emerge in their surprise uniforms. At 1 p.m., the ceremonial first ball is struck. According to legend, the rivalry began in 1982 when the commandant of the U.S. Naval Academy was speaking with St. John’s freshman Kevin Heyburn and remarked that the Midshipmen could beat the Johnnies in any sport. “What about croquet?” was the Johnnie’s retort. He later proposed the match to a group of Midshipmen in the interest of fostering better relations between the schools. The Johnnies recently won the USCA Nationals in Florida. Yes, Shane is an alumni of the college and the croquet team. I don’t know for certain about other players who have continued in the sport of croquet, but I know that Jared Bassman (A20) will be playing in the 2019 U21 Golf Croquet World Championship in London this summer. Another teammate, Tom Balding, recently won a major tournament in fall 2018. Facts obtained from the St Johns College website with the help and thanks from Kimberly Uslin. Check back later for more information about 2019 ticket sales and ground rules. The Annapolis Cup, which has been housed everywhere from the Little Campus (now Galway Bay) to a storage closet to the front window of 49 West in Annapolis, is now kept by the victors. 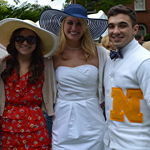 The Midshipmen wear crisp, U.S. Croquet Association croquet whites, along with a team tie, varying from year to year. The Johnnie uniform changes every year, revealed only minutes before each match. 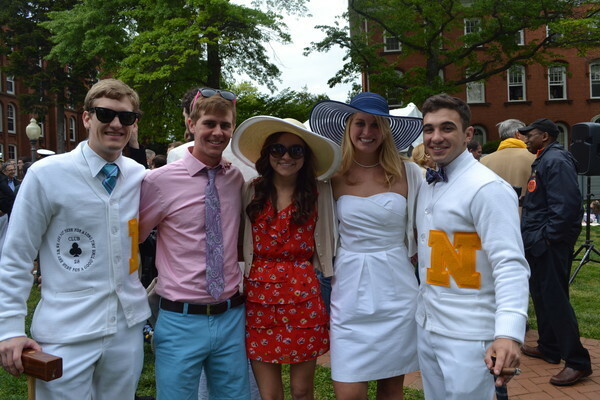 Past years have included camouflage, tuxedoes, Viking clothing, kilts, and even imitation USNA Crackerjacks. Several Plebes in dress mess uniforms serve the players refreshments. United States Croquet Association Collegiate National Championships: Both the St. John’s and the Naval Academy teams compete in the United States Croquet Association Collegiate National Championships. Courtesy and good sportsmanship are expected of all players. No players may throw a mallet or hit a ball in protest or anger. No trash talk is allowed. How the game is played: The game played at the annual match is nine-wicket croquet. A full-size croquet court is a rectangle 100 feet long and 50 feet wide. Nine metal wickets and two wooden stakes are arranged in a double diamond pattern. The object of the game is to advance the balls through the course by hitting them with a mallet, scoring a point for each wicket and stake made in the correct order and direction. The winner is the first side to score 14 wicket points and 2 stake points for each of its balls. For the Annapolis Cup, each side has 12 players divided into two-person teams. High fashion and camaraderie were the stars of the annual event. 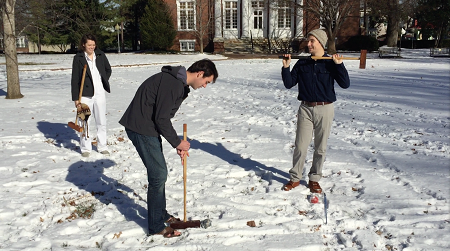 The 30th annual croquet match between St. John’s College and the Naval Academy is scheduled for Saturday.